My people, we did it. Thank you thank you from the bottom of what was once my cold, dark heart and is now a blossoming. flourishing rainbow heart sprouting unicorns from my chest. Thank you. In 30 days, we raised $16,829 from 253 backers. I am astounded. We finished this whole thing up on Valentine’s Day, and I took a nap. Then I drove to Corpus Christi for the fantastic Corpus Christi Songwriters’ Festival and spent all weekend hanging out with cool songwriters. I think the relief hit me yesterday, and I just kind of sat there staring into space for a minute or 30 and appreciating it all. Today, it was back to work. Emailing producer Dan about some scheduling stuff so we can actually get on in there and MAKE A RECORD. Setting up Facebook events for the tour that Shawnee Kilgore and I am going on in March to West Texas and New Mexico. Booking more summer stuff! It’s all exciting and very, very cool. 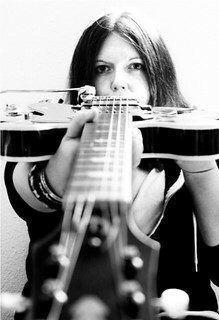 I can feel a hibernation mode coming on, so that songs may be polished and heck, even written. Now is not the time to stop! Thank you for your belief in me…we’re going to make something cool. I love that quote. It sums up a lot, and 2018 especially. I put off this post due to self-imposed pressure to Say Something of Meaning, especially since I started off my 2018 recap saying I was pretty down on the whole idea of the new year and what I was doing in it, which is not the general impression I’d like to leave. It’s not the general impression I have of 2018, either. 2018 was quite remarkable in a million ways. In personal victories, friendships deepened, songs written, shows played, places traveled. It was rich, all the while I battled with where I was going and what I was doing with it. Therein…lies the lesson? I have learned this lesson a lot but I always need a reminder…if you ask me my 5 year plan I’ll have a small freakout and stutter something generic at you. It’s not that I do not have a solid direction…I really think I do. It’s a gut feeling and I have followed it since I was a kid. It got me to Austin. It has landed me some of my closest friends and allies and creative partners. It has also brought me results that, if asked for specifics 5 years ago, I never would have laid out for you, because the real answer is that what has happened is better than what my simultaneously freaked out and very practical mind would come up with if asked. I learn that lesson over and over and 2018 was no exception: reality is cooler than my best goal guesstimate. I am so fortunate. With that in mind, I’ll keep paddling this boat blindfolded down the river (WHO SAW BIRD BOX?? ), but to pick a destination right now? I can’t, and I say that with excitement. I DO know…I’m gonna make a record, I’m gonna travel some more, I’m gonna keep my chosen tribe close. Those three things and I cannot lose. Thanks for hanging in with me on this very retrospective blog series. I’ll see you in 2019. PS: Not to leave you hanging with no photographic evidence…the last 2 months were filled with wonderful shows with great friends. Here’s to more of that, too. TEDxBartonSpringsWomen’s conference with Shawnee Kilgore, Noelle Hampton, and Wendy Colonna. This is how October made me feel. I slept, but much of it was on planes or for four hours at a time. All of it was fun, though. After going viral (she casually mentions, gripping her phone), I hopped a plane several times (I flew to Phoenix twice in one day thanks to wind shears) to Palm Springs for SongWriter Camp with 30 other really nice songwriters and some amazing mentors. Pam Sheyne and Richard Harris were our fearless leaders. See, earlier in the Year of Funk, I figured I should really do some professional development by way of writing, and that pop songwriting, while a thing I love, was not something I had been immersed in aside from copious amounts of listening / reading from afar. I don’t know any hit pop songwriters in Austin, so I went to California to find them. This workshop delivered in spades, as they brought in mentor after mentor with cool tracks to their name and lots of experience. We dissected songs that I loved and heard all the time, but hadn’t really known what was exactly going on with them to make them “Hits.” We broke off into groups of 3 and co-wrote 2 songs in 2 days, which made all our brains hurt but was super fun. Being around people who didn’t stare blankly at me when I mentioned how awesome Dua Lipa is was refreshing. I made a lot of new friends in four days which is not too shabby for this introvert. Then I hopped a plane home-NOPE. 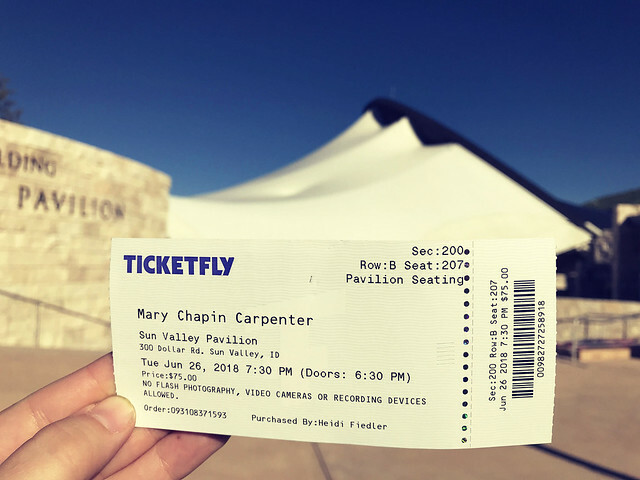 I flew to Dallas, because you will find that a recurring theme of this blog is that I had to see Mary Chapin Carpenter. The Colorado/Idaho trip was a magical reason to leave Texas in the summer, the DC trip was a pilgrimage, and of COURSE if MCC comes within 5 hours of my home I’m going to go so there I went. Kelly and Leanne swooped me up from the airport, we went to a wonderful show at The Majestic in Dallas on Friday night, slept in the worst Days Inn on I-35, and had to be up early to get to Austin for MCC doing a taping of Overheard with Evan Smith at KLRU. Like…peak PBS style. My nerd self was beyond happy. I asked a question during the Q&A, during which my hands went numb while waiting in line. You can see the whole taped episode here and you can see the Q&A right here, numb hands and all. One more MCC show in Austin and my Musical Tourism year was closed out with a roar…a beautiful roar. Also it seemed like I ran into everyone I know in Austin in the lobby of the Paramount which was really fun. My people have good taste. The other Big Thing that happened was I met with Dan Barrett in his NEW STUDIO. Dan, a great lesson in not being attached to the One Thing longer than it serves you, had closed down his Rubicon Studio and spent some time waiting on the right thing to come along. He found a beautiful spot in South Austin, and we met there to talk NEW ALBUM. My songs diverge into a couple of categories, and it becomes fairly clear when sifting through that I have onetwothreescream songs, and then I have songs that are more fit for a songwriter record. A more acoustic record. A folk record? That kind of record. That’s the kind of record I’m going to make with Dan. We talked BIG DREAMS. We talked logistics. We talked about the joy of us two hanging out together making stuff. Our track record with this is good. I feel ready. Throughout this whole year of wandering, I wrote a lot. I have about 40 songs to go through as options for this album (and for new onetwothreescream tracks, too!). That’s a pretty awesome feeling, and a nice realization to come to after feeling some moments of absolute slog throughout the year. I am armed with inspiration and good examples and options, which is about the best place you can be in when you want to make an album. So I’ll be on this porch a lot come February and March, and I’m excited to share that whole process, too. We’re not done with the year yet, though! October is broken up into parts, because WOW I packed a lot in. Hold on, people. Melinda Ann and I had a second Taylor Swift show to attend, this time in Dallas. As I mentioned before, we bought tickets a whole 11 months prior to this show, and the ticket buying process was so stressful (for what turned out to be the biggest grossing tour of the year thankyouverymuch) that when I saw some floor seats that did not cost my monthly car payment, I grabbed them. When we got to the stadium and found our spot, however…we realized we were RIGHT ALONG the walkway that Taylor uses to get from one small stage to another. She was gonna walk right past us, and walk right by she did. I almost fainted. She glows like fairies lighting up a glitter factory…or something. So that show was great and we once again sang and screamed and cried and laughed. I love that kind of concert roller coaster. The following Monday, still jazzed on the whole Taylor Experience, I was eating lunch at home and checking Twitter, as I do, and noticed that Mike Huckabee had said something lame in regards to Taylor’s (very welcome) social media reminder to vote in the November midterms. Whilst chewing, I composed an annoyed tweet at Huckabee. After getting up for a glass of water, I sat down and added one more tweet. I continued about my business. Then I looked down at my phone about 20 minutes later and…oh. Oh no. Notifications were going CRAZY. People were liking and retweeting. I had never gone viral before but I knew this was maybe something like…going viral. I just sat there and watched as reply after reply came in, and the like count on the posts grew by 50 at a time. It was kinda cool. Then I realized there are ton of literally insane people on the internet, and that a LOT of them live on Twitter. I started freaking out a little bit. I guess the tweetstorm that came at Huckabee got enough attention to be featured in the media, and my tweets were right there in the thick of it. I was simultaneously proud and terrified. Thanks, guy named Dave. The internet is a really wild, potentially terrible place. Humanity is wild and potentially terrible, too…but there were a lot of notes of support and mostly, the response was one of mirth and amusement. As I told my friends, IT GOES TO SHOW that my first taste of going viral online would be because I was defending T-Swift. In the end, it was a mild brush with virality. I got about 2,000 likes on each tweet, and the fervor died down in about three days. Everything is back to normal, and while it was stressful, I’ll have T-Swift’s back any day. ANY. DAY. Amen. And this was just the first week of the month…. August: Katie and I (who give good face when together) played an excellent show at Geraldine’s. We felt swanky. We were swanky. We swanked. I went to D.C. for the fun, I came back with a (fun) job. 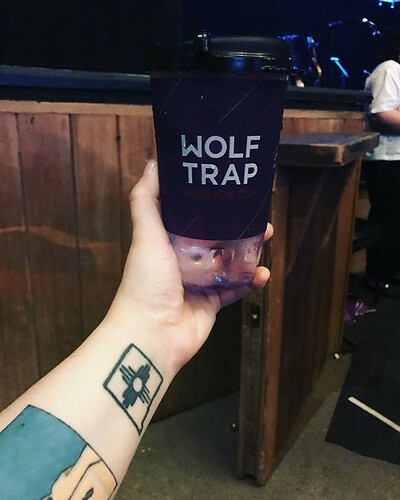 It was another musical tourism venture to Wolf Trap for the MCC Hometown Show (if you haven’t been to Wolf Trap I highly recommend it as a venue in general) and some educational and inspirational sight-seeing with both Heidi and my cousins Rochelle & Andrew & Emily (we got a Pentagon tour thanks to Andrew!). My friends Walt and Tina Wilkins were playing at a place called The Mansion on O Street the following evening, so of course we went to that. Turns out the Mansion on O is a very special, very magical place. Turns out they needed some social media stuff done. Turns out Walt recommended me and since I was there, I got to interview on the spot. Turns out I work with the Mansion on O Street now. And THAT is called…being in the right place at the right time. Musical tourism DOES pay off! Oh, and Walt and Ted (who, along with H, is one of the awesome proprietors of the Mansion) and Tina and Heidi and I sat in the Amnesia Room (really) for a good spell and sang and played Beatles songs. It was magic. That’s quite the August in my book. I came back excited about, well…everything. Grateful for the people in my orbit. Inspired by the past and hopeful for what is to come, from the macro level of our country down to the micro level of, well…whatever I am doing here, on this planet, in this country, in Texas, in my notebooks and with my guitar. Good. September: Another head down “do the work” month, from what I remember. (I’ll be honest with you guys, I am mostly jogging my memory by looking through my phone photos. Thank goodness for the extra brain we carry around all the time). I got to see Susan play with her former band The Groobees, which was insane because I became a Groobees (and Susan) fan right after they broke up 17 years ago…so I never had a chance to see them live. These reunion shows were very much anticipated and went SO WELL. It was fun to see them be all rock star and kill it, as we say in The Biz. Katie and I played at Emily Shirley‘s EP Release show (and you should go buy her Courage Up record right now), which was a blast. I remember it was hot in Texas, and all I really wanted to do was make it through the month to see…Taylor Swift. The Taylor Circus was not done, though…I’d call this a cliffhanger, wouldn’t you? May: This month is a blur, honestly. I think it’s because a lot of it was spent head down, working on the onetwothreescream EP. I threw one more song at Mark, 18 Hours, and we proceeded to have a ton of fun with it. This little tiny plastic microphone is responsible for all the speaking parts on this song, and Mark had to go into acting coach mode with me to get me to say my lines correctly! We saw Mary Chapin at the Denver Botanical Gardens, then we managed to see SusanG! play in Manitou Springs, because her tour schedule also takes her to Colorado in the summer which is smart. Then we went to Aspen for an MCC show, which is where I saw “CAVIAR” on a convenience store sign for the first time and I still feel weird about it. After a stop at DINOSAUR NATIONAL MONUMENT (if you know me, you know this was a big deal) we landed in Sun Valley, Idaho, where Heidi’s family has roots and where I had never been before. It’s a glorious part of the country and we sat on a bench on the hill one afternoon a made a toast to Heidi’s Dad, as is tradition. The shows were all, of course, fantastic. We danced a LOT. I’m not usually a Dancer (TM) because I am one of those musicians with two left feet, but when there’s a mini-folk-mosh pit happening, nothing really matters, and the truth of the matter is that dancing feels good, and if it feels good, do it. Also there are always profound moments in an MCC show that can move even the most cynical person to tears, so I figure the musical therapy alone was good for my weird 2018 feelings. The biggest lesson here is…whatever brings you joy…follow that, focus on it, consume it, embrace it. There’s a lot of negative input around us all the time – comparisons, “Should Haves,” the distortion of reality via social media, the news…so The Good Stuff. Find it. Then it was home…nope, I WAS NOT DONE. I flew from Denver to Nashville and met my friends Kristin and Carolyn (of Hardened & Tempered) for a little tromping around Music City. We had great chats with some Nashvillians, saw Vince Gill play with the Time Jumpers, and acquired baritone guitars because WHEN IN NASHVILLE. July: Then it was back to Texas to do a little thing I like to call RELEASING AN ALBUM. onetwothreescream’s Lit entered into the world as a little digital ball of folk pop on July 13th. This whole process, again, created a wad of Complex Emotions (TM) because…well, you write songs from your heart and brain. You record them with love and care and time (Mark’s hours put into mixing alone are…incredible. He’s a master). You then just THROW THEM OUT THERE. And you…sit. You wait. You hope people like them. You keep mental lists of who you might like to listen. You hope they do. Since you are not Jeff Bezos, you have no idea if they actually listen. You wait. People say lovely things. You make a mental list of lovely things. Your brain, trying to be a jerk because it’s bored? Makes a list of Other People You Would Like to Listen and Say Things. Sometimes you never hear either way. And this is just the brain thinking about all the people in your immediate circle. There are a billion articles on the internet about how artists and creatives SHOULD NOT base their worth on the reactions and reviews of their peers and friends and family, but we do it anyway. And then, there’s the whole “get it out there” thing. I spent days researching blogs and sending press releases and playlists and links around. I was a keyboard monkey all of July. It was kind of fun – there’s a thrill in the hunt, and a hopeful optimism every time you hit “Send” on an email. Statistically, success was low, but we did get some great support and write ups from some very lovely people. We got spun on KGSR in Austin, we talked to Rush in KOOP Radio, blogs said kind things, and if anyone hated it, they didn’t write about it (which is nice, too). And we like what we made, so we’re gonna make some more. Putting out a new Anything is a rollercoaster, and I bet everyone from the guy across the coffee shop from me to Lady Gaga gets these mood shifts when they finish a project. Overall, my review of releasing a folk pop album? 10/10 would do it again. I also helped out at a great summer camp for teenage girls through Real Life Real Music at The Settlement Home in Austin. These kids have dealt with a lot in their few years on this planet, and we went in armed with nothing but some guitars and the aim of helping them write a song and record it in a week. Anytime you want to rattle loose your own weird creative hangups, help someone else write a song. It works! So to recap: funk removal efforts Summer 2018 included travel, seeing music that makes you grateful to be alive, hanging out with positive, good people, helping other people make art, and making art. Checkmate. Wheeeeeeeew! Finally, a blog post. I’ve been pondering a post or 3 for months, but here we are, nearing 2019 and I am finally getting to it. I thought I’d try to parse together this year and explain what’s been happening…once I figure out what’s been happening. January 2018: Look, I won’t sugarcoat this. I felt BAD. I felt down. I felt a real sense of wasted time in the wrong place with the wrong timing and poor decisions. That’s vague because the feeling felt vague. This was probably in part to the new year vibe and all that brings, partially to being in Texas for a decade, which is a Milestone, and maybe your brain starts thinking You Should Have Something to Show For a Milestone. I thought about moving (I still think about moving), I thought about Getting A Real Job (oh please I have real jobs! ), I thought about writing an EFF YOU Manifest to…who? Me. The world. I don’t know. I went to New York City to see friends instead. It helped a little. February 2018: I went to Folk Alliance. This could either sink or swim a mood like that, going to a big professional networking event as an introvert who is having a mild art and career grump-isode. Folk Alliance was lovely, mostly due to the tribe I traveled with – Mandy Rowden and I had a blast going there and back, I met my musical tourist buddy Heidi there, and Mary Chapin Carpenter gave a keynote that was perfect and delivered at just the right time. Also there were old friends and new musicians to see and late night hallway roaming. It was good. I still felt weird. I put Kansas City on the list of places to move based on their downtown brick building ratio alone. I made one vlog all year: this is it. March 2018: Over in Social Thinkery land, which in part with gigging and teaching guitar is how I pay my rent and try to be of service to people in the world, something big happened. I joined the team to assist Eliza Gilkyson with her Kickstarter campaign. Eliza, if you do not know (AND YOU SHOULD) is an incredible artist, human, writer, musician, all of it. I first saw her play the Lensic in Santa Fe when I was in college, and she’s continued to be amazing in all things. We did the planning, the video, the launch, the campaign, the finish…and it was intense but it was a joy. We raised $55,000+ and Eliza made her beautiful album “Secularia” and it came out to rave reviews. Being a part of something like that was…transformative. All the while in here I had the total joy and relief of recording at Aerie Studio with Mark Addison. We made a name for our project – onetwothreescream – and I kept bringing Mark songs and he kept making them into angry-glossy-fun-joyful folk pop tracks. We found a thing! We decided to make a record. Things were…good! Warning: navel-gazing ahead. It’s why I have a blog! I’m in the weirdest summer mood. I have not had an unpleasant summer…it’s been a good one, actually. I took a notion to travel and see friends and music in June, when Texas had just started to assert its place in one of Dante’s rings, as it does every summer. I’ve been teaching. I’ve been writing. I put out an EP! But all the planets (or at least 5 of them) were in retrograde at one point in July and while I am never certain about how much stock I want to put into that sort of thing…the summer sludge is real, planetary or not. So in between music and work and travel I have impulsively begun gutting my living space. It started with my CD collection. I have been amassing discs since I was a pre-teenager, and I decided it was time to let some of them go. Books, too…which almost kills me. What IF I want to read assigned text from my History of Eastern Europe: WWI class again? WHAT IF? (I will not). The CDs I can digitize. The books…there are Kindles and the Google to handle it. Fine. I like to tuck things inside of things; I’ve been derailed on memory lane numerous times this past month. Notes passed in class in high school and recipes from my old roommates and dollar bills (yas!) have popped up. So have ticket stubs! I save them, but I never organize them. I bet there’s a scrapbooking aisle at Michael’s just for ticket stub organization. I have not been there. 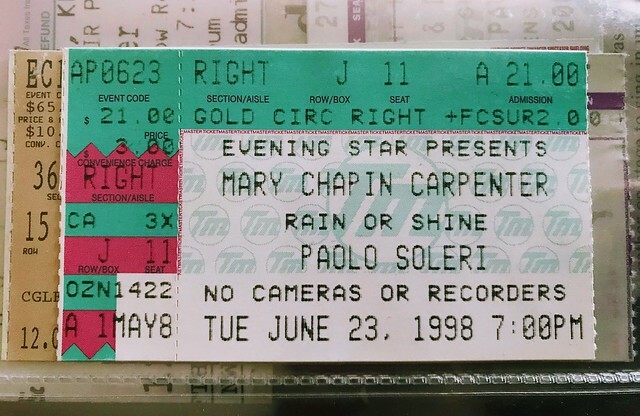 It is from the very first time I saw Mary Chapin Carpenter play live. June 23, 1998, at the Paolo Soleri Amphitheater in Santa Fe. My high school guitar buddies, Laura and Leilani, went with me, and my parents drove us the 45 miles from Albuquerque to Santa Fe. I remember yelling a lot and singing along. I don’t remember much else, I was just so excited to be there. I met John Jennings for the first time. He was the kindest human being on the planet to a 15-year-old kid who was starstruck. It took a minute to realize that 1998 was…20 years ago. As the typically unused numerological part of my brain kicked into gear, I realized that THIS year, I spent that very same week of June in Colorado and Idaho, seeing the mountains and…seeing Mary Chapin play again. 20 years later, here we both are. That kind of floored me. So much has changed, of course. One of my nephews was born that year, and he is in college now. My Dad and all my grandparents have passed on. I’ve lived in Texas for 12 years. The aforementioned Paolo Soleri Amphitheater in Santa Fe is not there anymore. We spin so fast on this blue ball that stuff shifts or flies off it completely with some regularity. A coping skill I have developed is to not think about it too much. It’s been a weaving and winding couple of decades. I’d like to think I have grown like a messed up weed, shooting up tall and darting off side to side and working my way through my 20’s and (gasp) half my 30’s with some roots established while still waving new sprouts and leaves around awkwardly. I’m grateful. Grateful for a glance back at the teenager, who I think would probably be ok with the path taken thus far. Thankful for these musical North Stars in my life that consistently give so much joy and meaning in new ways while providing a connection to how it all began. Grateful to MCC for making beautiful records and touring all this time. I just got back from an incredible weekend in Washington, D.C. that included MCC’s final summer tour show at Wolf Trap and some historical wandering. I am pretty sure 15-year-old me would be very proud of my decision making skills in the music + travel department…I hope I continue to make that kid light up. Happy 20 to MCC, thanks for everything. Here’s to many more!